This week the tomatoes in my garden went crazy! Currently, I have eight of them sitting out on my deck, several ready to be picked in the garden and another half dozen in the fridge! All of these from only 3 little plants. 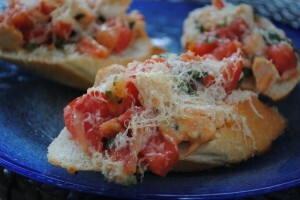 I decided that today, tomato recipes were just the sensible thing to do so I came up with a bruschetta recipe using tomatoes (of course) as well as some chicken breast I had on hand and fresh summer basil! A yummy combination for sure, that we happily devoured for today’s lunch. Combine all ingredients in a large bowl, and toss to evenly incorporate and coat. Allow mixture to sit in the fridge for several hours for the flavours to mesh together. Preheat oven to 450 degrees F. Top slices of the baguette with a generous spoonful of the tomato and chicken mixture and sprinkle the cheese over top. Bake for about 8-10 minutes until cheese is melted.